The Evaporator D project at Sellafield is currently the largest nuclear project in the United Kingdom. The ‘Evap D’ facility, once completed in 2016, will treat liquid radioactive waste so that it can be vitrified ready for disposal. Essentially Evap D acts like a giant kettle, reducing the volume of liquid nuclear waste before it is turned into glass and stored. The £300 million contract for the construction of the Evap D facility was awarded to Costain who used innovative off site construction techniques to pre fabricate the facility as 11 huge ‘modules’ at a specially adapted 5 acre factory site near Ellesmere Port in the North West of England. This was the first use of modular construction for a process plant at the Sellafield site. The construction of the eleven Evap D modules represented a complex engineering challenge. The largest of the modules, ‘Module 920’ weighs 525 tonnes and is 27 metres long, 7 metres wide and 12 metres high. In Module 920 alone there is over 5000 metres of high integrity stainless steel pipework constructed to the most exacting nuclear industry standards. The project logistics provided an additional challenge. 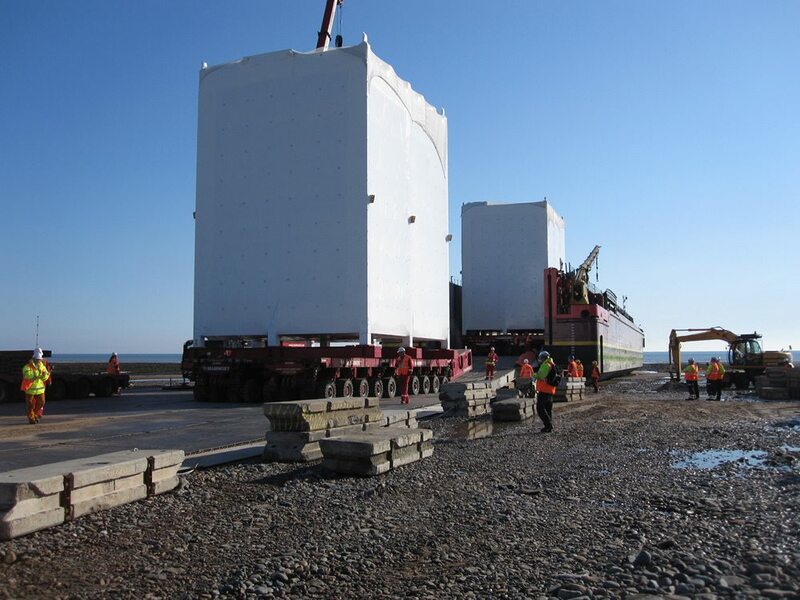 How could such huge modules be completely protected against weather damage during the 65 mile journey by road & sea from the manufacturing facility to the construction site? Any salt water entering the modules and into the many stainless steel pipes & welds that the modules contained could have serious implications for the future safe operation of the nuclear facility and delay this high profile construction project for many months. Therefore, a temporary sheeting solution was needed that guaranteed, whatever weather conditions were experienced, it would not fail. After months of tests, including some on site demonstrations of the industrial shrink wrap process, Costain and construction partners Interserve chose a shrink wrap covering as their preferred transport protection solution. However, as the Evap D modules did not have any solid sides, there was concern that, even after heat shrinking tightly, high winds could push the shrink wrap into large ‘voids’ behind the sheeting and cause damage. The customer suggested something never tried before which was to cover the entire Evap D module in a HDPE plastic mesh to form a ‘support structure’ beneath the shrink wrap. A geotechnical mesh product that had been designed for installing underground to stabilise soil was hung around the module and secured to the module using a woven strapping. Next, working from the outside, using ‘cherry pickers’, 12 metre wide sheets of 300 micron thick shrink wrap sheeting were hung and heat welded together before being shrunk ‘drum tight’. The final step, to make the shrink wrap cover ‘bomb proof’, and to provide the 100% guaranteed weatherproof protection that this project required from the temporary sheeting was to make a small hole in the shrink wrap sheeting every 1 square metre and pass a velcro tie through the shrink wrap and around the mesh. (The hole was later taped to maintain a weatherproof seal). It was felt, that with the shrink wrap shrunk tight AND tied back to the supporting mesh every 1 square metre this was the most robust solution that could be designed. 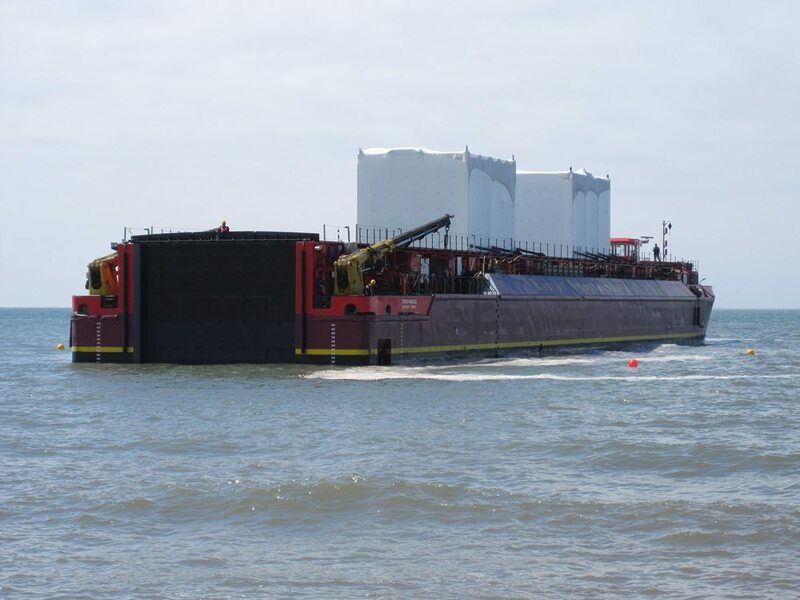 The final module was delivered from Ellesmere Port to Sellafield by specialist barge ‘Terra Marique’ in September 2013. After shrink wrapping 11 modules, over a 2 year period, the weather proofing of the giant modules using shrink wrap sheeting was a 100% success, with no sheeting failures or water ingress.